Metals such as iron, manganese, copper, lead, and zinc are crucial to the operation of modern society, and, in small amounts, are generally beneficial for human health. The exception is lead, which is toxic at all levels and hence deserves special consideration. Often we find that the processing of these metals, or in some places their natural occurrence, has led to concentrations in air, soil, and water that are toxic for humans and other organisms. This website explores the origins of these metals in the earth's surface, their extraction, and some ways in which they return to the natural environment. MINING. The removal of ores from the ground and their grinding and processing commonly leads to the release of metals through the air or water. In practice, the geological context of the ore -- the minerals intergrown with the ore minerals ("gangue") and the rock strata interbedded with the ore ("waste rock") -- are all important in determining the mechanisms and the severity of metal release (see for example The Environmental Geochemistry of Mineral Deposits from the Society of Economic Geologists). The Sedimentary Ore Deposits pages explore this context. 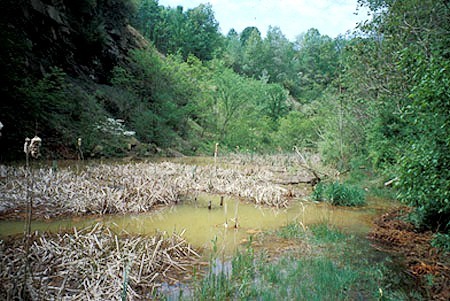 Most water contamination from mining has its origin in Acid Mine Drainage. The Constructed Wetlands pages describe some of the remediation processes that can be used to control this drainage. Mining activities also pose a considerable threat from failures of mine waste structures. The Tailings Dams pages present case studies of 4 such failures with multiple fatalities. DRINKING WATER QUALITY. The chemical makeup of water is crucial both for human health and for industrial applications. These pages cover the geochemistry of metals in distribution systems arising from corrosion of brass, copper, iron and lead components; the geochemistry of metals in contaminated groundwater; and the chemical properties of various bottled waters. METALS IN ROADSIDE SOILS. 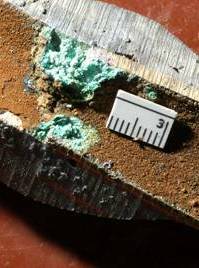 Very high levels of lead and of other metals occurs in a strip of soil about 10 or 20 feet wide alongside most heavily-travelled roadways. Some of the metals come from vehicle exhaust, but brake and tire wear also contribute. If the wind remobilizes these soils (think of mowing after a dry spell), there is a potential for human exposure. METALS IN LONG-ABANDONED INDUSTRIAL SITES. Unsupected concentrations of heavy metals lurk in urban areas where forgotten industrial sites once existed.